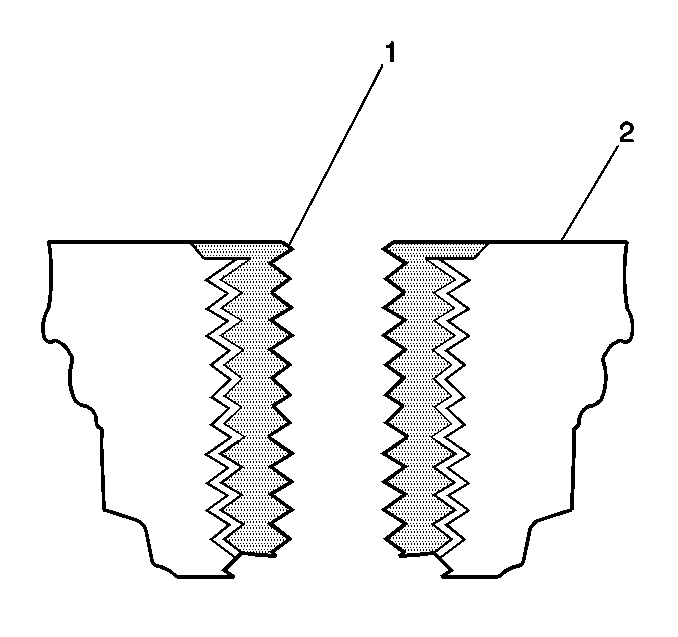 The thread repair process involves a solid, thin walled,self-locking, carbon steel, bushing typeinsert-(1). During the bushing installation process, thedriver tool expands the bottom external threads of the insert intothe base material-(2). This action mechanically locksthe insert in place. Also, when installed to the proper depth, theflange of the insert will be seated against the counterbore of therepaired hole. Note:The use of a cutting fluid, WD-40®, orequivalent, is recommended when performing the drilling,counterboring, and tapping procedures. Refer toAdhesives, Fluids, Lubricants, and Sealers. Driver oil MUST be used on the installer driver tool. The tool kits are designed for use with either a suitable tapwrench or drill motor. 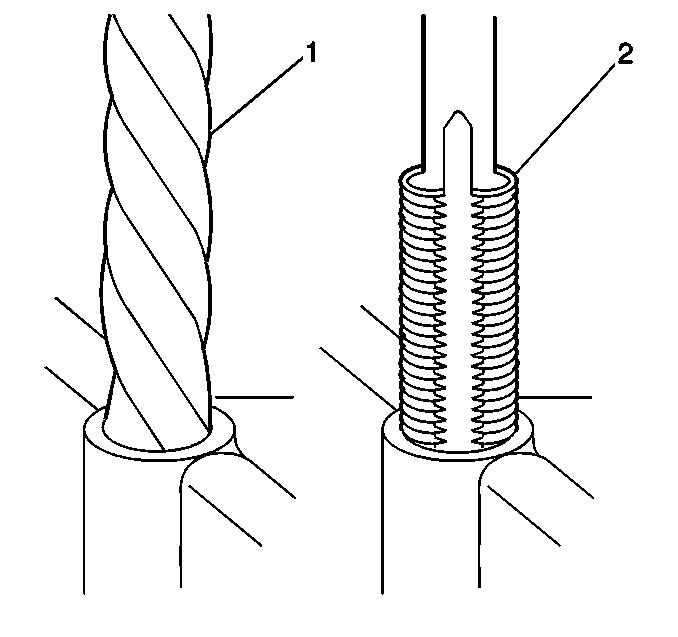 Drill out the threads of the damagedhole-(1).M6 inserts require a minimum drill depth of 15-mm(0.59-in).M8 inserts require a minimum drill depth of 20-mm(0.79-in).M10 inserts require a minimum drill depth of23.5-mm (0.93-in). Using compressed air, clean out any chips. Counterbore the hole to the full depth permitted by thetool-(1).Using compressed air, clean out any chips. 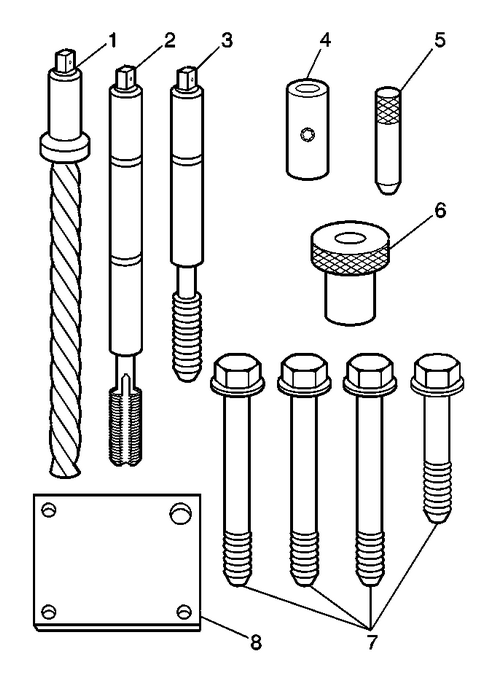 Using a tap wrench-(2), tap the threads of thedrilled hole.M6 inserts require a minimum tap depth of 15-mm(0.59-in).M8 inserts require a minimum tap depth of 20-mm(0.79-in).M10 inserts require a minimum tap depth of 23.5-mm(0.93-in). Using compressed air, clean out any chips.Spray cleaner into the hole. Refer toAdhesives, Fluids, Lubricants, and Sealers.Using compressed air, clean any cutting oil and chips out ofthe hole. Note:Do not allow oil or other foreign material to contact theoutside diameter-(OD) of the insert. 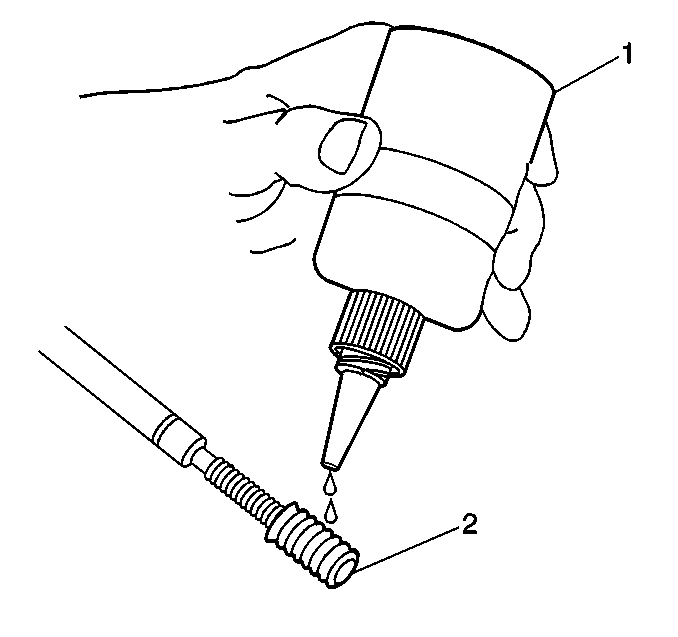 Lubricate the threads of the installer tool-(2)with the driver oil-(1). Install the insert-(2) onto the drivertool-(1). Apply threadlock LOCTITE™-277,EN 42385–109 -(1)loctite, or equivalent to the insert ODthreads-(2). Install the insert-(2) into the hole. Install the insert until the flange of the insert contactsthe counterbored surface. Continue to rotate the installertool-(1) through the insert. The installer tool will tighten up before screwing completelythrough the insert. This is acceptable. 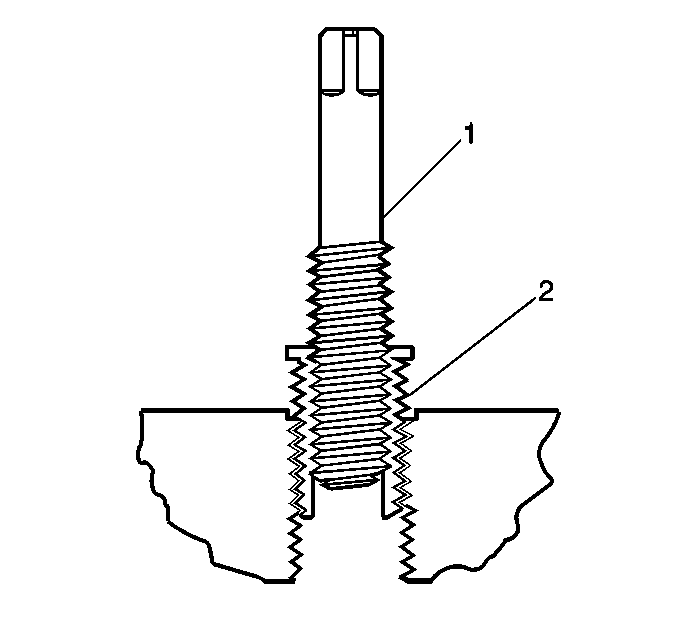 You are forming the bottomthreads of the insert and mechanically locking the insert to thebase material threads. Inspect the insert for proper installation into thehole. A properly installed insert-(1) will be eitherflush or slightly below flush with the surface of the basematerial-(2). Note:The use of a cutting fluid, WD-40®, orequivalent, is recommended when performing the drilling and tappingprocedures. Refer toAdhesives, Fluids, Lubricants, and Sealers. Install the fixture plate-(3),bolts-(1), and bushing-(2) onto the engineblock deck. Position the fixture plate and bushing over the hole that isto be repaired-(4). Position the alignment pin-(1) through the bushingand into the hole.With the alignment pin in the desired hole, tighten thefixture retaining bolts-(2).Remove the alignment pin from the hole. Install the sleeve-(2) onto thedrill-(1), if required. 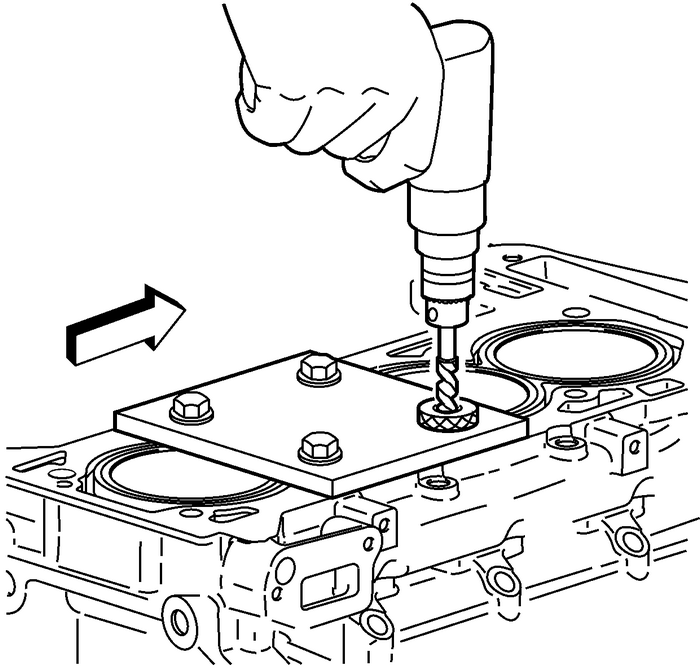 Note:During the reaming process, it is necessary to repeatedlyremove the drill and clean the chips from the hole. Drill out the threads of the damaged hole. 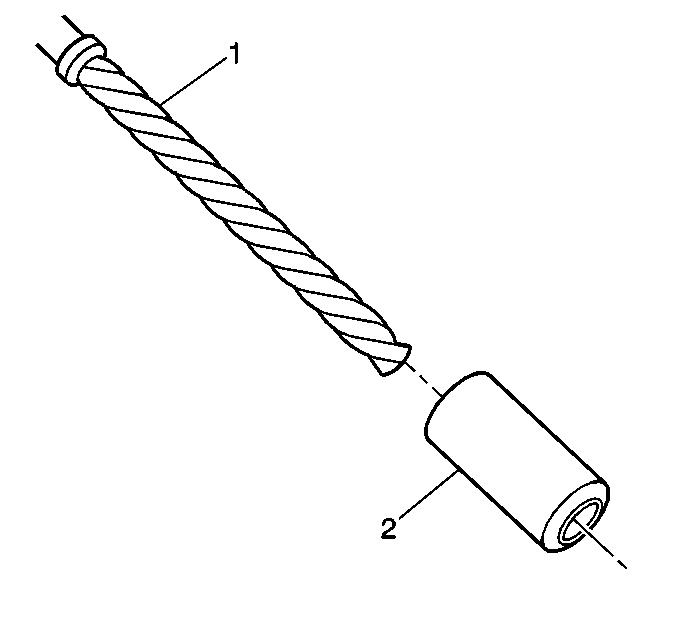 Drill the hole until the stop collar of the drill bit or thesleeve contacts the bushing. 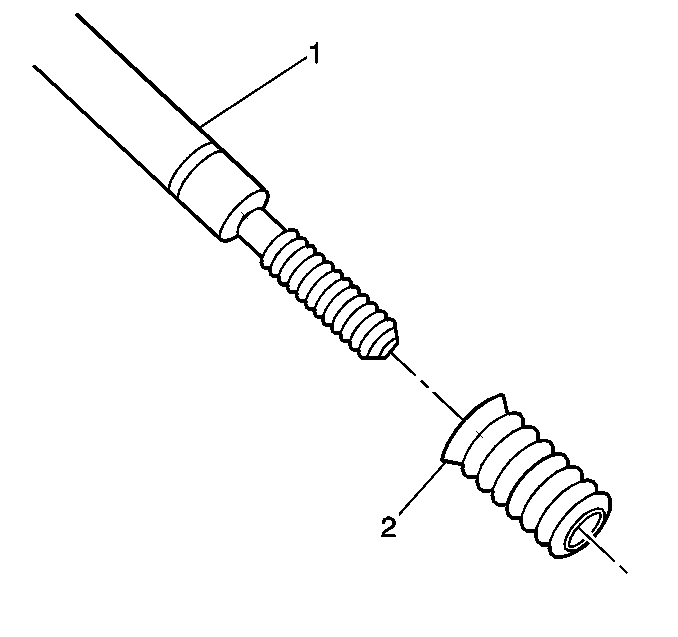 Using a tap wrench, tap the threads of the drilledhole. In order to tap the new threads to the proper depth, rotatethe tap into the hole until the mark-(3) on the tapalign with the top of the drill bushing-(2). 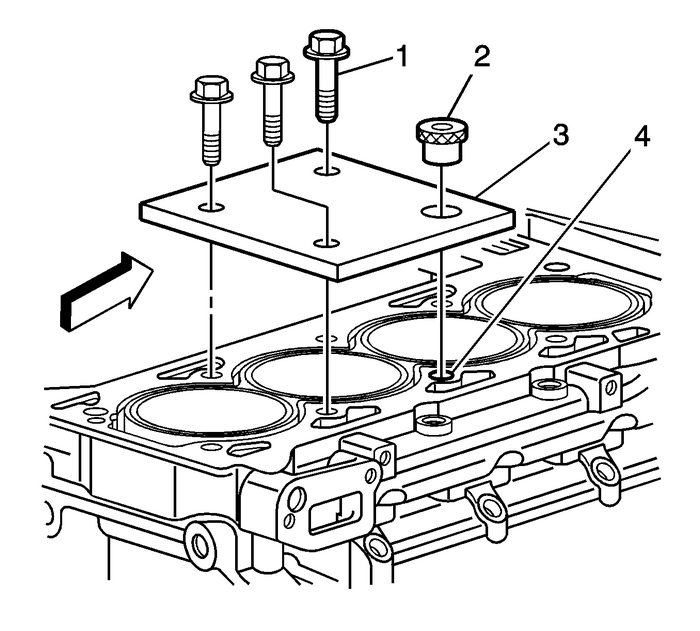 Remove the fixture plate-(1),bushing-(2), and bolts. Note:Do not allow oil or other foreign material to contact theoutside diameter -(OD) of the insert. Apply threadlock LOCTITE™-277,EN 42385–109loctite-(1), or equivalent to the insert ODthreads-(2). Install the insert and driver-(1) into thehole. 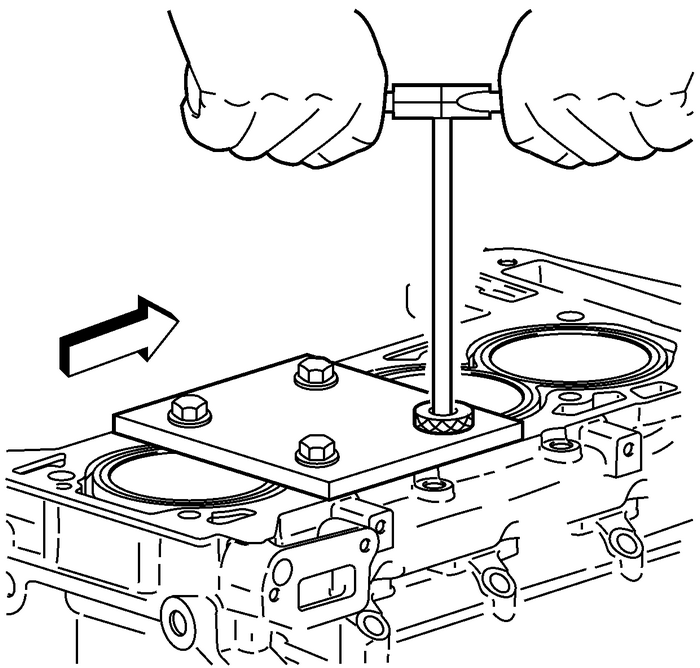 Rotate the driver tool until the mark on the tool aligns withthe deck surface of the engine block. 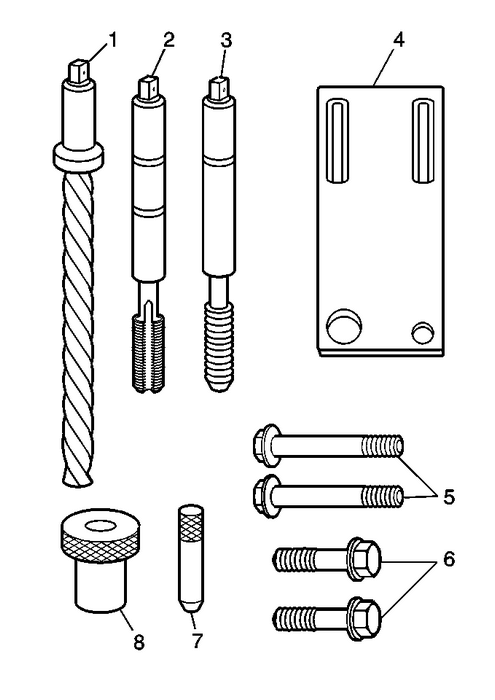 Remove the alignment dowel pins from the holes(1–4), if necessary. Install the fixture plate, bolt, and bushing, onto the engineblock. Position the fixture plate and bushing over the hole that isto be repaired. Position the alignment pin in the desired hole and tightenthe fixture retaining bolts.Drill out the damaged hole. 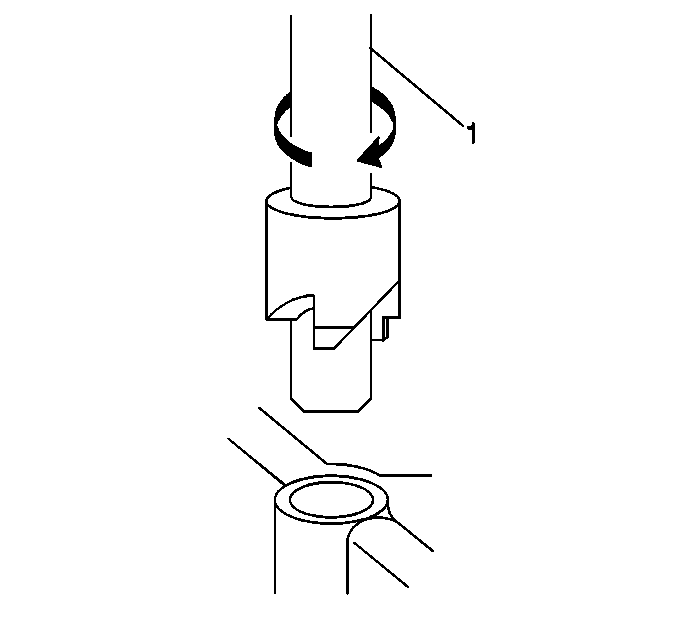 In order to tap the new threads to the proper depth, rotatethe tap into the hole until the mark-(3) on the tapaligns with the top of the bushing-(2). 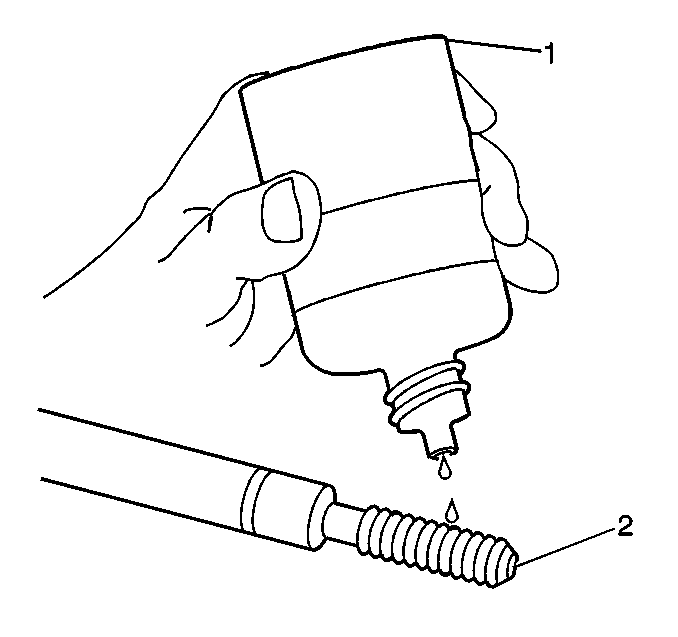 Apply threadlock LOCTITE™-277,EN-42385–109-(1), or equivalent tothe insert OD threads-(2). 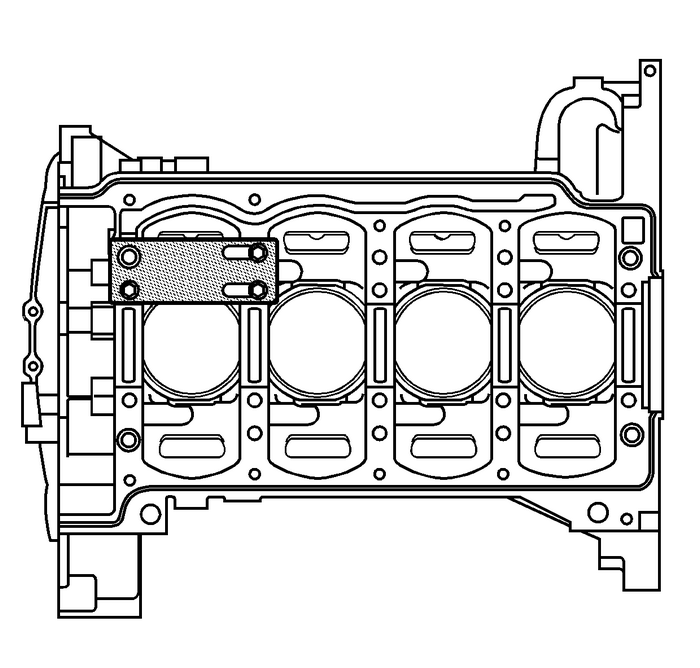 Note:The fixture plate and bushing remains installed onto theengine block during the insert installation procedure. 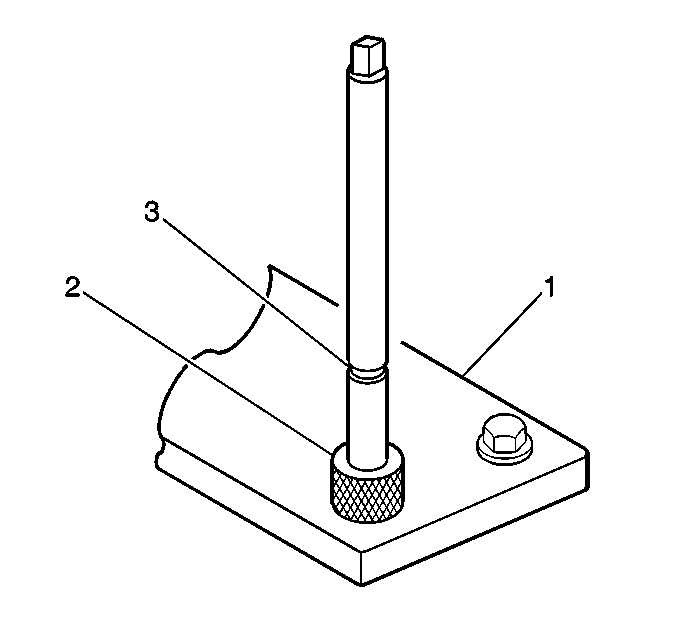 Install the insert and driver through thebushing-(2), fixture plate-(1) and into thehole. 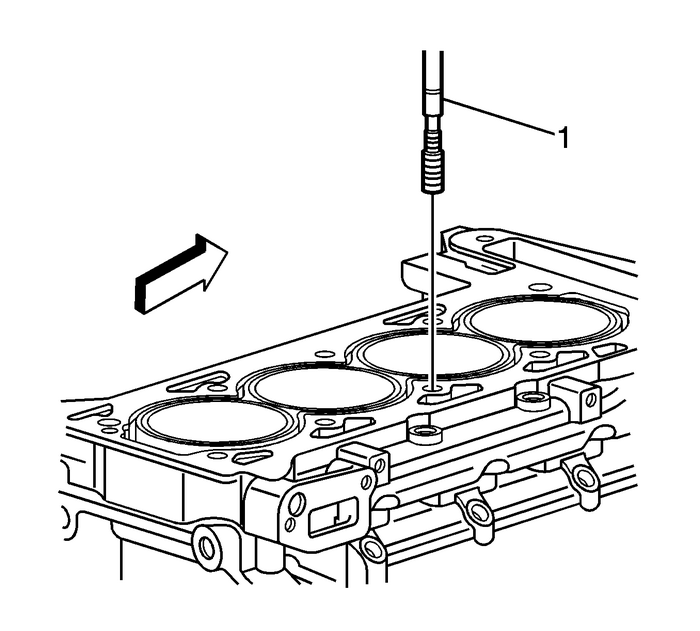 Rotate the driver tool until the mark on thetool-(3) aligns with the top of thebushing-(2). 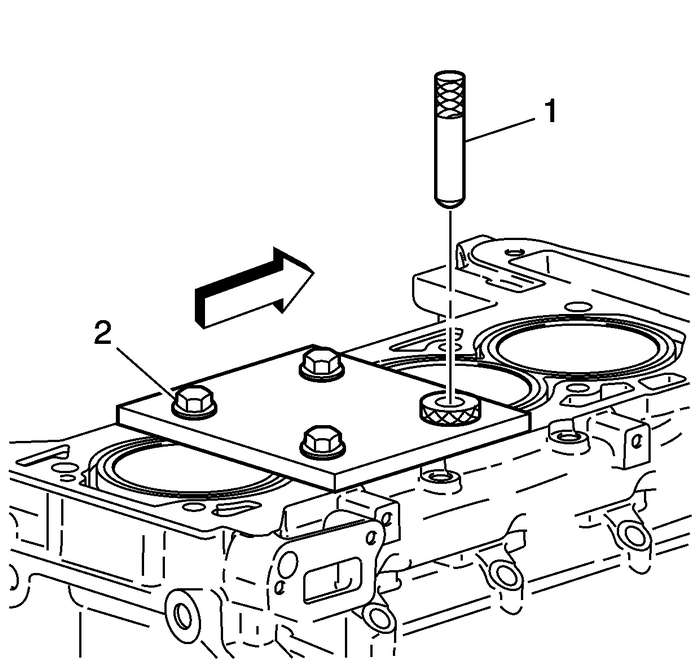 Remove the driver, bushing-(2), fixtureplate-(1), and bolts. 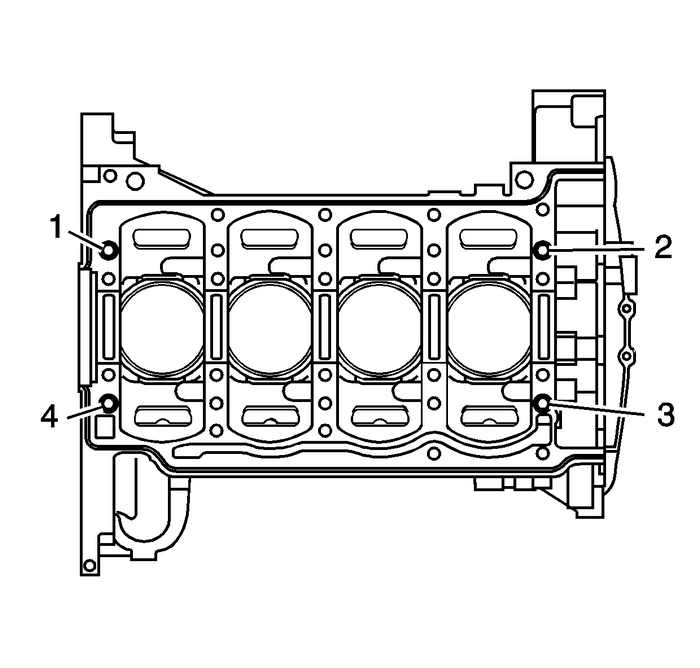 Install the alignment dowel pins inholes-(1–4), if necessary.